Marauders and mutants and cyborgs, oh my! 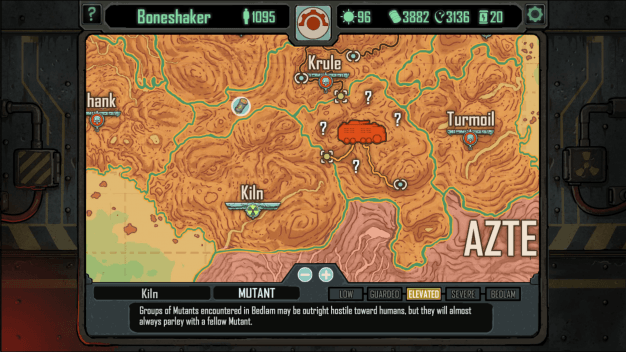 Skyshine’s Bedlam is a game of getting from point A to point B with a few life-threatening pit stops along the way. After a time of limitless technological advancement, mankind’s greed and hunger for power led to a devastating period called the Barren Age when war left the world nearly uninhabitable. In Bysantine, survivors of the Barren Age make a life for themselves on the scraps of junk left over from better days. Rumors exist of a place called Aztec City where life has been untouched by the Barren Ages. You take on the role of the mechanic, whose mission is to assemble a fearsome crew, equip your dozer for whatever may come your way, and set out to see if these rumors are true. Your journey takes you through Bedlam, a no-man’s land hit hardest by the Barren Ages. 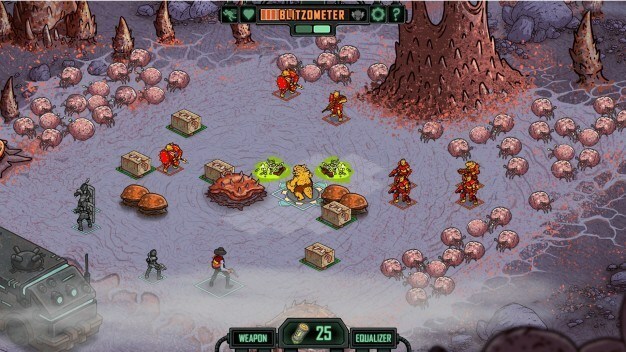 Marauders, mutants, rouge A.I, and cyborgs fight among themselves for territory in this wasteland. Above them all stands the self-appointed ruler of Bedlam, King Viscera. As the mechanic, you’ll have to carefully manage your resources and crew to make it to through. The game begins by selecting your dozer, the vehicle that will (hopefully) get you, your crew, and your passengers to the safety of Aztec City. 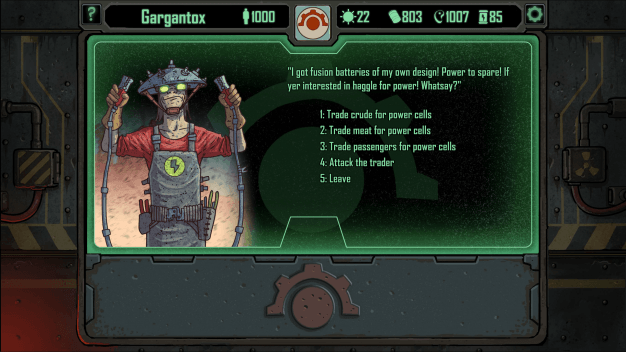 Each race has an associated dozer, each with special attacks and a unique balance of attributes in the following categories: food consumption, crew heal time, power cell efficiency, and oil consumption rate. Imagine the beginning of Mario Kart, but instead of defending yourself from blue shells, it’s going to be vicious half-robots. All of these attributes can be improved later on by upgrading them using power cells. Initially, your only dozer option is that of the humans with the rest waiting to be unlocked. Compared to the other races, the humans are kind of boring, so there’s definitely a good reason to keep playing and unlock the other dozers. You will also choose your difficulty before you set off – easy, normal, or BEDLAM. Unlockables and achievements can’t be unlocked on easy mode though, so while it’s a great way to get your dozer’s wheels dirty, you’ll have to work for those achievements. Once you’ve made your final preparations, you and your crew head out into the vast and wild region of Bedlam. Travel through Bedlam means moving through different regions each controlled by a different group. Once you get to a region, points of interests will show up that may yield useful resources or passengers or they may just lead you to a group of baddies waiting to take you down on King Viscera’s orders. Each trip you make, whether it is to a main or side point, will cost you precious food and fuel, so travel becomes a matter of balancing resources and weighing the risks against the possible gains. On top of that, the more time you spend roaming Bedlam, the higher your threat level goes; the higher your threat level, the harder the encounters get. This travel system is nice because you can avoid a boss or choose to take a different path, but difficult because you begin to run low on resources fast and you never know when you will come across a fresh supply of food or oil. 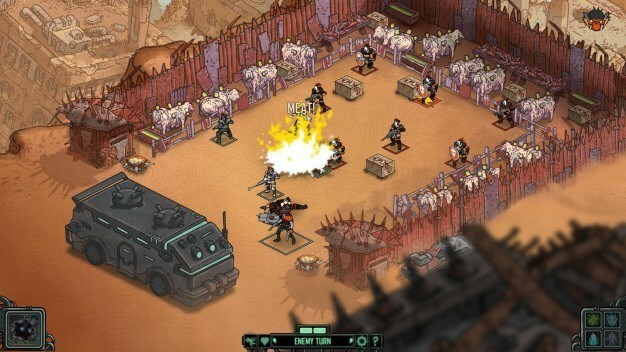 Skyshine’s Bedlam features a battle system that offers a new take on a rogue-like system. Sometimes you will run into a friendly traveler who is willing to talk with you or even trade, but more often these stops along the trip to Aztec City will land you in the hands of a vicious Bedlam occupant who for no clear reason wants to murder you. Each encounter begins with selecting your team. Fighters come in four classes: frontliners for melee attacks, deadeyes for long-distance shooting, and gunslingers and trenchers for midrange shooting. The number of people you can take depends on your difficulty level, but you can take any combination of classes you want and you can always take less than the maximum to receive a bonus to your rewards once you win. Your crew levels up through kills, but if they are the ones to fall, they aren’t coming back – once they die, they are dead for good. You begin with four members in each class, so you have to choose your team wisely. Your team faces off on a randomly generated playing field that usually features a few supply crates available for the taking. 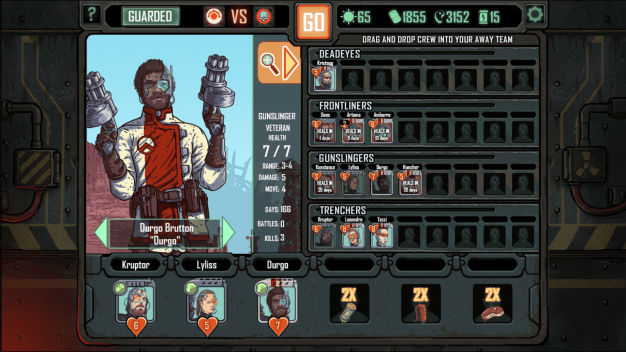 Battle is turn-based, and one of the features unique to Skyshine’s Bedlam is that each turn consists of only two actions for the whole team. Your dozer also comes in handy in battle: by using power cells, it can send out large-scale attacks and support your crew by healing them or reducing their damage. Add a small field to the damage that each class can do and their allotted movement, and the battle system begins to tilt off balance. It becomes difficult to move characters out of range before the enemy’s turn, and because your crew members start with relatively low health, one or two hits may be enough to kill one of them for good. This was really frustrating even after my crew began leveling up, especially because it was so much work to keep them alive long enough to level up at all. The bosses were near impossible with their lackies surrounding them. As the game went on, battles got harder, meaning more enemies spawned on the battlefield, which made getting my team out of harm’s way even more difficult. Ultimately, the plot of Skyshine’s Bedlam isn’t very noteworthy. The whole point of the game is to get from one place to another. Aside from encounters with enemies, nothing adds to that along the way. King Viscera, the self-proclaimed king of Bedlam who hunts you down with his henchmen through the entire game doesn’t even make an appearance until after you find out whether the rumors of Aztec City are true or not. Then you have to head back into Bedlam to search him out. The fact that the game throws in a new objective after your first is finished makes the game feel unorganized. While the game may be about venturing into an expansive, barren wasteland, its graphics are anything but lifeless. Up close, characters are unique and detailed. On the battlefield, your crew and enemies take on an almost cartoonish appearance, but not in a bad way. The bright graphics and clear lines make it easy to tell what is going on on the field and characters stand out from the backgrounds so that you don’t have to worry about overlooking anyone. When it all comes together, Skyshine’s Bedlam isn’t too bad a way to spend an afternoon. Combat can be frustrating at times and the story doesn’t offer much original material, but the drive to do better next time and the sense of adventure that comes with never knowing what you’ll come across in Bedlam is enough to keep you going and get your passengers to safety.